Why Bang Bang? I was listening to this on my iphone while pouring these... https://www.youtube.com/watch?v=fi_4YiPHGzc .....and these tins have been taking some explosive hits and fish since they have been out fishing! 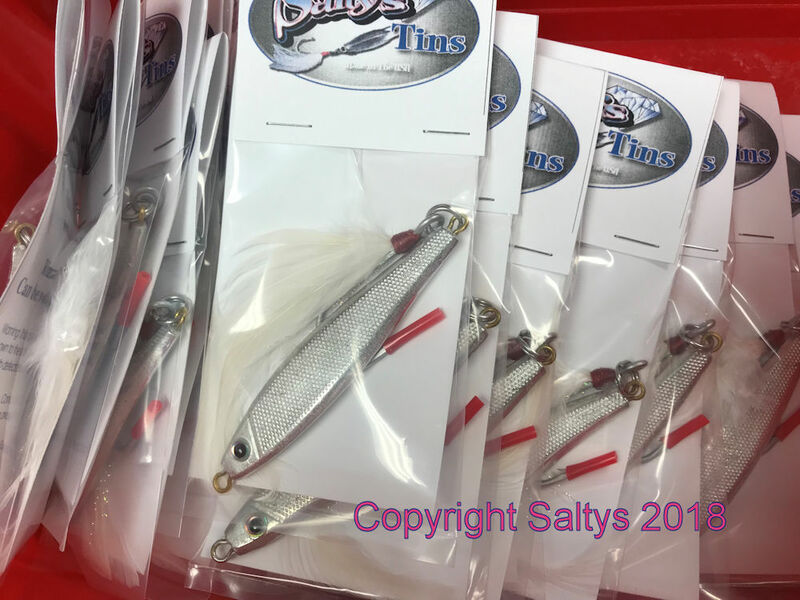 New for 2018 the 1.5 oz BANG BANG Tin from Saltys. Will have these up on the site soon as I get some time to build the page. 100% Virgin Tin. 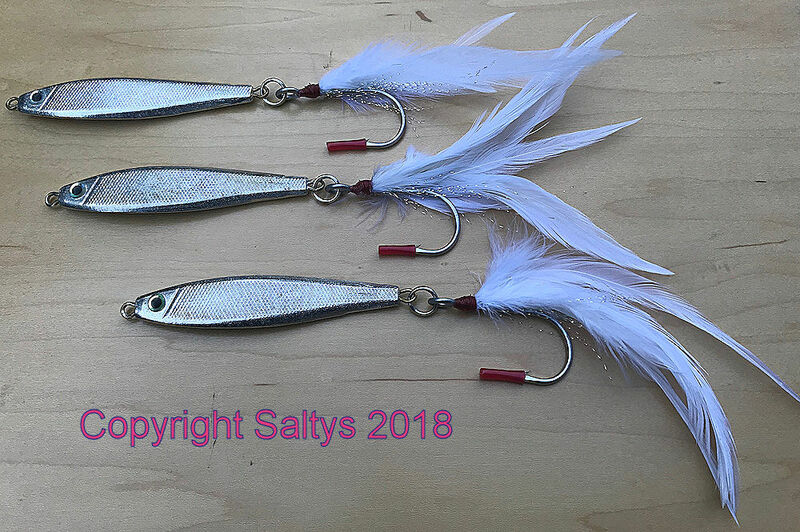 Saltys high dressed feather tails specifically for our tins with VMC permasteel hooks & Rosco hardware! A few years ago I found & bought a large number of original Kenden molds to make these. Most of the molds were unfortunately sold piecemeal at NJ flea markets but I got enough of them to come up with some real good stuff starting with these. As some have seen I have been actively working on a 4oz tin for some time. Still haven't perfected it but when it does will be a big hit in the canal etc! Stay tuned! Next up is the Kenden Peanut Tin...this real small butterfish style tin will be very hot for Bonito & False Albacore! Hope everyone has a Safe & Happy July 4th Holiday! School of Bang Bang Tins I kill myself sometimes. If there is any old timers out there, would love to hear any information on exact years these Kenden lures were made. It's my understanding these were from the 40's and 50's. Many of their shapes were duplicated by Charlie Graves or vice versa. Unsure. They have identical models in all pictures I've seen of them. Last year I was contacted by the gentleman who helped Charlie De Pasquale make his original tins. That was really cool! He saw the tins on the site and gave a thumbs up. Finally got some time to get the page built for the site. Very busy! Dua Lipa just nominated for a Grammy! Last week it was announced she broke the record for most attended performances in USA, beating THE ROLLING STONES!!! Totally not fishing related lol!